The IBM LaserPrinter 4029 is a compact, nonimpact, desktop laser printer that attaches to IBM Personal Computers, IBM PS/2* products, IBM RISC System/6000* computers, IBM RT systems, IBM displays, and other IBM systems. Refer to "IBM Personal Printers Marketing Reference Guide" for details. The 4029-010 is a 5 pages-per-minute LQ, PC Parallel/Serial, LaserPrinter 5E. The IBM LaserPrinter 4029 Model 010 is shipped with a Starter Cartridge. The 4029-020 is a 6 pages-per-minute LQ, PC Parallel/Serial, LaserPrinter 6. The IBM LaserPrinter 4029 Model 020 is shipped with a Starter Cartridge. The Model 021 IBM LaserPrinter 5E is capable of producing letter quality text at speeds up to 5 pages-per-minute. The Model 021 has addressable resolution of 300 x 300 dots per inch (DPI) with upgradability to 600 x 600 DPI. The LaserPrinter A Series Model 021 is compatible with Apple** and Macintosh** systems and/or AppleTalk** Network connectivity. The Model 022 IBM LaserPrinter 6 is capable of producing letter quality text at speeds up to 6 pages-per-minute. The Model 022, besides the Adobe PostScript interpreter, has an additional 1 MByte of optional printer memory as standard, for a total of 2 MByte of RAM. The Model 022 has addressable resolution of 300 x 300 dots per inch (DPI) with upgradability to 600 x 600 DPI. The LaserPrinter P Series Model 022 supports the IBM Personal Printer Data Stream(PPDS), Hewlett-Packard LaserJet** Series II(PCL4), and plotter emulation. The 4029-030 is a 10 pages-per-minute LQ, PC Parallel/Serial, LaserPrinter 10. The Model 030 is shipped with a High Yield + Cartridge. The 4029-040 is a 10-pages-per-minute LQ, PAR/SER, OUT Bin/Sensor, LaserPrinter 10L. The Model 040 is shipped with a High Yield + Cartridge. 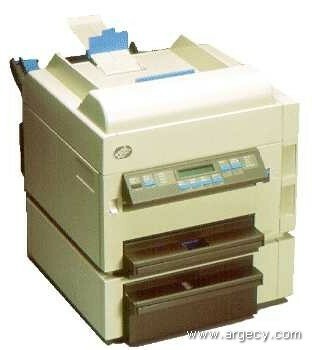 The Model 041 IBM LaserPrinter 10 is capable of producing letter quality text at speeds up to 10 pages-per-minute. The Model 041 is equipped with 4 MByte of optional printer memory, for a total of 5 MBytes of RAM, an Adobe PostScript interpreter, and a 250 sheet output bin with bin full sensing. The Model 041 has 600 x 600 DPI resolution as standard. The LaserPrinter A Series Model 041 is compatible with Apple** and Macintosh** systems and/or AppleTalk** Network connectivity. The Model 042 IBM LaserPrinter 10L is capable of producing letter quality text at speeds up to 10 pages-per-minute. The Model 042 is equipped with 4 MByte of optional printer memory, for a total of 5 MBytes of RAM, an Adobe PostScript interpreter, and a 250 sheet output bin with bin full sensing. The Model 042 has 600 x 600 DPI resolution as standard. The LaserPrinter P Series Model 042 supports the IBM Personal Printer Data Stream(PPDS), Hewlett-Packard LaserJet** Series II(PCL4), and plotter emulation. Optional software emulations include Hewlett-Packard (HP) LaserJet Series III (PCL5) emulation, and PostScript. Superior font offerings -- 16 built-in outline typeface styles. High-speed parallel, serial interfaces standard. Member of the IBM LaserPrinter family with full compatibility of supplies and features (except additive memory features, PostScript, and PCL5 emulation). A model upgrade feature is offered for the IBM LaserPrinter 6. It will upgrade the IBM LaserPrinter 6 to an IBM LaserPrinter 10. It consists of a system card, fuser modification hardware, installation instructions, and logo plates. The 020 and 022 model upgrade kit converts the IBM LaserPrinter 6P (4029-020 / 022) to an IBM LaserPrinter 10 (4029-030) giving the customer an upgrade path from a 6PPM printer to a 10PPM printer. The kit contains a 4029-030 system board, fuser modification hardware (provides envelope conditioning mode), logo plate and an instruction sheet. The 021 performance upgrade kit converts the 6PPM Model 6A to a 10PPM 6A printer, thus giving the customer a performance upgrade path. The performance upgrade kit contains a 4029-041 system board, fuser modification hardware (provides envelope conditioning mode), performance upgrade sticker and an instruction sheet. Parts removed as a result of the upgrade become property of IBM. High resolution, 600 x 600 dpi postscript printing capability (standard on models 10a and 10p), 4mb additional printer memory required on 6A 6P. User-friendly 16-character LCD operator panel.